Reliable, rugged, proven military systems. Since World War I, Dana has supported U.S. military operations by engineering rugged, reliable Spicer® drivetrain products for a wide variety of defense vehicles traveling in the most extreme environments, including MTVRs, unmanned ground vehicles, MATVs, JLTVs, and HMMWVs. Spicer products are now the military standard for defense vehicles around the world with dependable, easy-to-maintain technologies and interchangeable parts found in systems like Spicer® CTIS. 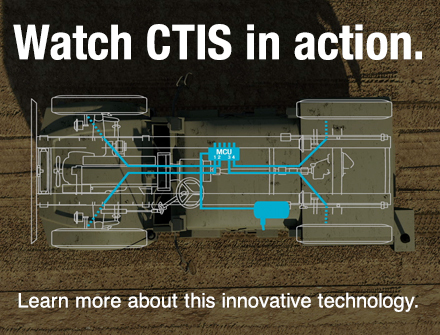 With the press of a button from inside the cab, CTIS adjusts tire pressures to maximize mobility and traction on any terrain. The Oshkosh M-ATV, AM General HMMWV, and Navistar MaxxPro are just the latest vehicles to benefit from this innovative technology. Spicer® Optimized Tire Pressure Management System for military applications allows drivers to select operating mode and automatically control tire pressures through any environment. Take a look inside the system. Detailed information for all military products.